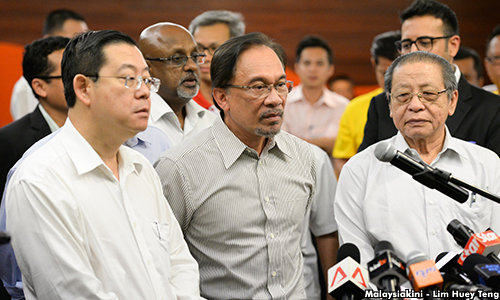 Malaysiakini : YOURSAY | Let us call a spade a spade and work towards expunging the debt. Anonymous_b3cdcd05: PKR de facto leader Anwar Ibrahim is entitled to his view just like the commentators here considering he is like any one of us as he has no specific role in the current Pakatan Harapan government. That probably is why PM Dr Mahathir Mohamad has turned a deaf ear to some of his questionable antics ever since his release. In fact, even Finance Minister Lim Guan Eng need not have responded but appears to have done so out of common courtesy. But unlike you and me, Anwar must bear in mind that his wife, Wan Azizah Wan Ismail, is an integral part of the Harapan cabinet and his actions will be seen as in complement with her or likely to compromise her position. It is quite apparent that Anwar is impatient and in a hurry to take over, but in his haste, he is in danger of dangling on the long rope extended to him. Ricksen: The exposes by Guan Eng had to be made to exonerate the Harapan government of liabilities in the future when they have to surface. Foreign investors initially shocked by the amount of over RM1 trillion (in national debt and liabilities), will appreciate the up-front transparency, and have already started to calm down when they realise that the new government is determined to stem corruption and bring the economy back to good standing. But what really shakes foreign investors’ confidence is the disunity shown by statements within the high ranks of Harapan, such as this one being made by Anwar; a superfluous statement made just to show he is currently still relevant despite being in the shadow.